For a fabulous range of locally baked bread, made fresh every day, contact the Farmhouse Bakery in Halesworth today. We specialise in handmade bread, rolls, French bread, savouries and cakes, and our shops offer a wide range of freshly made bread rolls every morning. We offer a large selection of made to order special occasion cakes. Order your wedding cakes, birthday cakes, or cakes for any family celebration and our cake designers will work with you to produce a unique design. Our master bakers prepare fresh bread to order for wholesale deliveries. Call and ask about our discounted rates for shops, hotels, pubs and restaurants. Give us a call or get in touch by email using the handy form on the Contact Us page of this website. 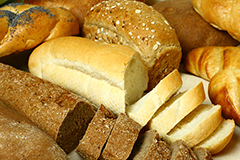 Call in to one of our shops in Halesworth, Bungay or Southwold to see the full range of fresh bread, rolls, cakes and savouries on offer each day.